FDR remains a great hero to liberals but is criticized by conservatives for shifting the nation to the Left, growing the federal government, imposing regulations on business, following a no-growth economic policy, catering to labor unions, and building a permanent New Deal Coalition. Conservatives further disagree with Roosevelt's concealment of his declining health from American voters in the 1944 election, and Roosevelt's weak stance towards the communist Soviet Union which enabled it to gain control over Eastern Europe for the following half-century. His New Deal was a very large, complex interlocking set of programs designed to produce relief (especially government jobs for the unemployed), recovery (of the economy), and reform (by which he meant regulation of Wall Street, banks and transportation), as well as Reelection (in 1936, 1940 and 1944) and Realignment of the Fifth Party System. Conservatives strongly opposed many, but not all, of the New Deal programs. Conservatives abolished most of the relief programs when unemployment practically ended during World War II. Most of the regulations on business were ended about 1975-85, except for the regulation of Wall Street by the Securities and Exchange Commission, which still exists. The major surviving program is Social Security, which Congress passed in 1935. Conservatives at the time denounced his bids for presidential power, including building a national political machine through the WPA (it lasted from 1935 to 1943), attempting to take control of the Supreme Court by adding new liberal judges (an attempt which failed, 1937), and trying to purge the Democratic party of conservative congressman (an attempt which failed in 1938). The failures of those attempts can be attributed to the Conservative Coalition which emerged in Congress in 1937 as a coalition of most Northern republicans and most Southern Democrats. After 1938 FDR turned his attention to World War II. He was a strong supporter of Nationalist China under General Chiang Kai-shek against Japan; most conservatives agreed on that point. FDR also was a strong supporter of military aid to Britain. Conservatives split on that, with the "isolationists" (like Robert Taft) opposed, and "interventionists" (like Henry Stimson) in favor. Pearl Harbor brought the U.S. into the war in December, 1941; all conservatives then strongly supported the war effort. They generally approved FDR's military leadership, although they were highly critical of his close cooperation with Stalin and the Soviet Union. FDR was the first and only President to be elected four times, breaking the traditional two-term-limit precedent established by George Washington. Improperly concealed from the public was how Roosevelt's health was failing rapidly in 1944-45, even as he ran for reelection. Photographs suggest he was suffering from melanoma, but information about Roosevelt's medical condition continues to be concealed. He died on April 12, 1945, reported from a massive cerebral hemorrhage that could have been caused by metastatic melanoma. Scholars generally agree that relief efforts actually helped to prolong the Great Depression. It was only later that World War II brought a return to near full employment for every sector of the economy. But Roosevelt supporters felt he exuded a sense of confidence and hope for the future that made for a charismatic personality, despite having polio that permanently crippled him starting in the early 1920s. 9 Failure of "competitive administration"
Franklin was born to two old families, both based in upstate New York: the Dutch Roosevelts, and the Yankee Delanos. His father James Roosevelt (1828-1900), a wealthy railroad executive, was never close to Franklin and died when he was in college. Franklin was the only son of Sara Roosevelt (1854-1941), who exerted tight control over the family money, and tight psychological control over Franklin, until the day she died in 1941. The Delanos made their money in trading with China (originally, in selling opium); Sara was a world traveler who raised her son with the aid of tutors until he went to Groton at age 14; by that time Franklin had been to Europe many times and spoke fluent French and German. He was a gentleman at Harvard College, where he edited the student newspaper. He graduated from Columbia Law School, and was a successful lawyer before entering politics in 1910, and again while out of politics in the mid-1920s. Franklin Roosevelt met Eleanor, his fifth cousin, in 1902. He began courting her, and they became engaged in 1904 against his mother's wishes. Sara Roosevelt thought Eleanor too young and inexperienced. The couple was married on March 17, 1905 in New York; her uncle, President Theodore Roosevelt, gave the bride away. She and Franklin lived with his mother Sara, who controlled both the finances and the raising of her grandchildren. Six children followed in rapid succession, with all but one surviving infancy: Anna Eleanor, James, Franklin (died 1909), Elliott, a second Franklin Delano, and John Aspinwall. FDR was elected as a Democrat to the New York State Senate in 1910, but the family remained in New York City. In 1913 the family moved to Washington where Franklin was the powerful and popular Assistant Secretary of the Navy during World War I. Very shy at first, Eleanor kept a low profile during World War I. She became more accustomed to the limelight when Franklin was the Democratic nominee for Vice President in 1920, and when he was elected governor of New York in 1928 and 1930. After he contracted polio she became much more active, serving as his spokesperson at many meetings around the state and advocated for women's issues inside the Democratic Party. The Roosevelt marriage collapsed in 1918 when Eleanor discovered Franklin had a lover. Divorce was politically impossible, love was absent. The solution was independence. By the 1920s Eleanor was living apart in a separate cabin on the Roosevelt estate at Hyde Park. Since the public knew nothing about the affairs (and historians did not learn until after Eleanor's death), the couple kept up appearances in public. Eleanor increasingly built her own career, all the while supporting liberal and leftist personalities and ideas. In 1920 Roosevelt was the Democratic nominee for Vice President. He lost in the Harding landslide, but the fact that he won the nomination demonstrates that Democrats looked upon him as their new hero. In 1928 Franklin Roosevelt was elected governor of New York, despite a narrow victory in the state by Republican presidential candidate Herbert Hoover. FDR was reelected governor in a landslide in 1930. As governor of the leading financial state he did nothing to prevent the Wall Street Crash of 1929 or solve the emerging financial depression, but he did begin a relief program that followed the Hoover Administration guidelines. In 1921 FDR became ill with poliomyelitis. The polio left FDR without the use of his legs, confined to a wheelchair for the most part. In 1927 he founded the Georgia Warm Springs Polio Rehabilitation Center, which maintained a Whites-only policy of admission. This discrimination was sustained by a scientific argument about polio itself - that Blacks were not susceptible to the disease. The center practiced racial discrimination into the 1960s. With the economy continuing a downward spiral despite Hoover's efforts, a Democratic victory seemed certain. Roosevelt needed two-thirds of the delegates too get the nomination. He easily beat out Al Smith, his former close ally. FDR won the nomination with the aid of powerful publisher William Randolph Hearst (still a liberal at the time), and the Texas delegation led by House Speaker John Nance Garner. Garner was given the vice presidency. Smith in 1932, Hearst in 1934, and Garner in 1937 all broke with FDR, becoming bitter enemies. The election was a rout, with Democrats winning sweeping majorities in Congress and control of state governments in all parts of the country. Hoover tried to coordinate national policy with FDR during the long interregnum between the November election and the March 4 inauguration, but Roosevelt refused to cooperate. For Main Article see New Deal. FDR is most famous for his New Deal, a set of programs designed to produce recovery from the Depression, reform so it would never happen again, and relief for the tens of millions suffering severe hardships. In order to help set up his New Deal, FDR brought in a group of advisors who would be known as the Brain trust. FDR's favorite program—and the nation's favorite as well, was the Civilian Conservation Corps, begun in springc 1933. The CCC sent several hundred thousand young men at a time—2.5 million in all by 1943—to newly formed work camps for 6-month stints. There were no uniforms or military drills. It was strongly approved at the time by conservatives and liberals alike, including most religious and business leaders as a way to save the boys who were perpectually unemployed and drifting into gangs. The CCC was ended in 1943 when the need had vanished. In 1934-35 the Second new Deal showed Roosevelt moving left. Key innovations included the Wagner Act (1935) that created the National Labor Relations Board and allowed Labor unions to rapidly expand. The WPA was a federalized relief program, in which 2+ million unemployed workers were hired by the federal government to work on projects sponsored by local government. Most important of all was the Social Security program, passed over intense Republican opposition. Roosevelt successfully built up the "New Deal Coalition", a powerful coalition of voters and interest groups. Key components included big city machines and labor unions. Key voter groups included traditional Democrats, white Southerners, Catholics, Jews, and liberals, as well as many blacks. This united voter base allowed Democrats to be elected to Congress and the presidency for much of the next 30 years. After a sweeping landslide reelection in 1936—losing only Maine and Vermont—Roosevelt stunned the nation, and his party, by calling for legislation to enlarge the Supreme Court by five new members. Tommy Corcoran was given the task by Roosevelt to persuade Congress to pass the proposed legislation. I. F. Stone of the New York Post, who was later to work for the Soviet KGB, wrote speeches for Corcoran to promote this issue. A firestorm of opposition erupted, led by his own vice president John Nance Garner. Roosevelt was defeated by an alliance of Republicans and conservative Democrats, who formed a Conservative Coalition that managed to block nearly all liberal legislation. (Only a minimum wage law got through.) Angry with the conservative wing of his own party, Roosevelt tried to destroy it. In 1938, he actively campaigned against five incumbent conservative Democratic senators; all five senators won re-election. Under FDR, the Democratic Party became identified closely with modern liberalism, which included the promotion of social welfare, unions and regulation of the economy. Civil rights were not on the party agenda at this time. When FDR was inaugurated for his second term national income, payrolls, and industrial production were still 20 per cent below the 1929 figure and construction was still only about one third what it had been in 1929 when the nation had a booming economy due to massive speculation that would ultimately lead to the stock market crash. By June, 1937 the Treasury boasted relief payments were less than in the same period the preceding year. But this was not so. The Treasury made a practice of cooking the books and producing phony numbers. It merely shifted relief payments to other accounts. They were, in fact, larger than the year before. Stock prices declined and by September the reality could be no longer hidden. By the end of October the market crashed. The budget was running a deficit at the time $300,000,000 a month. 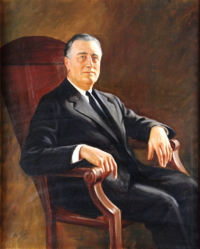 FDR told DNC Chairman James Farley he would have "to go in for pump priming or relief," but as Farley explained FDR complained he could not spend on local projects because the states and cities did not want any more buildings and institutions which they would have to support in perpetuity. They were having trouble enough paying the bills of those already built. Roosevelt revealed to Farley that many WPA projects approved by the government were abandoned because the states and cities could not raise the money to support them. In the 1938 Congressional elections Harry Hopkins was spending as fast as he could without any regard to utility to meet the immediate political necessities of an election but couldn't go on indefinitely. And the whole problem was complicated by pressure from within his own party to balance the budget. Real Output and Growth remained stagnant throughout the New Deal largely due to government involvement. The Depression came back with a vengeance in 1937-1938. New capital made available for investment amounted to $348,000,000 in 1935. This was less than 1/10th of the amount available in 1929. By contrast, the British economy had nearly recovered to its 1929 levels by 1935, and the amount available for investment was almost twice as much as the United States. The country now reached a greater crisis than in 1933. The National debt, which was $22 billion when Roosevelt took office and largely a heritage of World War I, now was $37 billion. Taxes had been more than doubled by Roosevelt. By April 1938 unemployment reached several thousand more than when Roosevelt was elected in 1932. This was now Roosevelt's Double Dip Depression. Voices began to speak up suggesting after all Hoover may have known what he was doing, but here, nine years after the Depression began the fundamental condition of the country was no further advanced than it was at the end of Hoover's three-year struggle with it. The Second Term was a failure, for FDR had overreached and his efforts to fight the conservatives in the business community, the GOP and his own party (in the South) produced a backlash against excessive presidential control. With war braking out in Europe in 1939, FDR turned to foreign affairs. Early in 1939 FDR made up his mind to seek a third election in the presidential election of 1940. FDR realized the political difficulties involved in a third nomination so he concocted a "draft Roosevelt" movement. He kept other candidates dangling in hope, including Democratic National Committee Chairman James Farley, whom FDR rejected because he was Roman Catholic, and Secretary of State Cordell Hull. Administrative Assistants to Roosevelt included James Forrestal, Lauchlin Currie and David K. Niles. Their function was to get information and to condense and summarize it for Roosevelt's use. FDR soon moved Forrestal to the Navy department, where he took over the responsibilities of the incompetent secretary. Public opinion on entering the war became polarized in very complicated ways. Conservatives divided into pro-war ("interventionist") and anti-war ("isolationist") blocs, as did liberals. Republicans split and Democrats split. FDR was the leader of the interventionist liberal Democrats, but he was opposed by old allies like John L. Lewis and Joe Kennedy, and supported by old foes like Henry Stimson. In general the dispute was entirely focused on Europe. Virtually every group was hostile to Japan and supported a strong pro-Nationalist China policy, which FDR pushed vigorously. Tokyo was threatened: end its invasion of China or FDR would—and did at the urging of KGB agent Harry Dexter White working as an Undersecretary of the Treasury—cut off Japan's oil supplies. Japan responded to an ultimatum—written by Harry White—with a decision for war. Once Pearl Harbor was attacked (Dec. 7, 1941), all the prior divisions vanished overnight, and all groups supported the war effort. Later stories to the effect that FDR knew about the Pearl Harbor attack in advance were all false fabrications. In his 1944 State of the Union Address, he proposed a Second Bill of Rights. Roosevelt in 1941 formed an alliance of convenience with Stalin to defeat Hitler. In August 1939 Stalin made an alliance with Hitler under which both jointly waged aggressive war against Poland; the two divided Poland between them, as Germany turned toward France and Britain and the Soviet Union invaded Latvia, Lithuania, Estonia, and Finland. With Roosevelt strongly supporting France and Britain, the Communist Party USA at Moscow's direction began attacking Roosevelt in the wildest terms and did so for the next twenty-two months. In the 1940 election, pro-Moscow elements in the CIO forced John L. Lewis to turn against Roosevelt and support the liberal Republican Wendell Willkie. Roosevelt meanwhile moved right, and brought into top jobs the GOP vice presidential nominee from 1936, Frank Knox (a conservative who became Secretary of the Navy) and conservative Republican lawyer Henry Stimson, who took over the War Department. Rejecting advice from its communist organizers, 90% of CIO members voted for Roosevelt, who was easily elected to a third term. Roosevelt was determined to help Britain and at one point after Pearl Harbor Winston Churchill even moved into the White House to coordinate war strategy. Isolationists, led by the America First Committee and Senator Burton K. Wheeler tried to block the moves toward war. I heartily deprecated the banishment of religion - though I knew that some day Russia would return to religion for the simple reason that four or five thousand years of recorded history have proven that mankind has always believed in God in spite of many abortive attempts to exile God. The Soviet Union, as everybody who has the courage to face the fact knows, is run by a dictatorship as absolute as any other dictatorship in the world. It has allied itself with another dictatorship [Germany], and it has invaded a neighbor [Finland] so infinitesimally small that it could do no conceivable possible harm to the Soviet Union, a neighbor which seeks only to live at peace as a democracy, and a liberal, forward-looking democracy at that. In June 1941 Germany invaded Russia, and Communists on Moscow's instructions immediately switched from anti-FDR isolationism to support for FDR and demands the US enter the war. The conservative isolationists were convinced that FDR was conniving to somehow trick the American people and enter the war. Public opinion steadily moved to support FDR's aggressive policies against Japan and Germany. In early December 1941 a military officer gave Senator Burton Wheeler, an isolationist liberal Democrat, a copy of the top secret American war plan for fighting Germany. Wheeler gave it to the Chicago Tribune, which published the secrets in a desperate effort to weaken the American military so much that Roosevelt would avoid war. Pearl Harbor came a few days later and Wheeler and the isolationists went quiet. The policy makers in Washington—including those at the newly constructed Pentagon—wanted to focus on defeating Germany. Public opinion (and the Navy) insisted on defeating Japan first. Given the military situation, there was little in 1942-43 the U.S. could do to open a ground front in Europe except send military supplies to Britain and Russia, which was done. The war in 1942-43 of necessity focused on Japan, and it was a very hard-fought war primarily with naval aviation. The great American victory at the Battle of Midway ended the Japanese blitzkrieg and evened out the forces. Japan was unprepared for a long war, and already by early 1942 the U.S. had far more warships and warplanes under construction than Japan did. Before the material edge became decisive, American forces defeated the Japanese at the Battle of Guadalcanal. By 1943 the "island hopping" campaign under Admiral Chester Nimitz in the central Pacific, and under General Douglas MacArthur in the Southwest Pacific was inexorably pushing American forces toward the Japanese home islands, with the goal of invading them and capturing Tokyo. American and British troops invaded North Africa in 1942, and Sicily and Italy in 1943. In retrospect these were not major strategic goals, but they did provide the Army with the combat experience needed to prepare for the real invasion of France in June 1944. By then the German Luftwaffe had been destroyed by the U.S. Air Force, and the vast advantage in war material made the German military position hopeless. With the huge Russian armies pressing in from the east, and the smaller but more powerful Allied armies coming in from the west, the Nazi war machine was crushed in 1944-45. FDR worked very closely with his military advisors, and followed their strategic advice. His stated policy was fostering diplomatic relations with Britain, the Soviet Union, and the Chinese Nationalists. Stalin publicly disbanded the Comintern in 1943 in return for lend-lease aid of food and munitions. A message from Moscow to all KGB stations relating to this event is one of the most important messages in the entire corpus of VENONA translations. This message clearly discloses the KGB's connection to the Comintern and to the national Communist parties. John P. Davies was assigned to Gen. Joseph Stilwell as Stilwell's adviser in China. Hopkins made a note at the time: "The President indicated his strong dissatisfaction with the way the whole show was running in China. He stated that Stillwell obviously hated the Chinese and that his cablegrams are sarcastic about the Chinese and this feeling is undoubtedly known to the Generalissimo." Roosevelt and Hopkins biographer Robert Sherwood wrote that Gen. George C. Marshall told Hopkins his only serious disagreement with Hopkins was on the issue of Stilwell. Sherwood adds that "he was unquestionably a serious nuisance to Roosevelt and there were many times when he was on the verge of recalling him." In February 1944 Congress rejected Roosevelt's demand for a $10,500,000,000 tax increase and cut it to $2,300,000,000. Roosevelt vetoed it saying this was a "bill not for relief of the needy but of the greedy." Senator Alben Barkley, Democratic leader, rose on the floor of the Senate to say the veto was "a calculated and deliberate assault upon the legislative integrity of every member of Congress." The entire Senate united in a roar of applause. Barkley declared that after seven years of carrying the New Deal banner for Roosevelt, he would resign his post as Democratic majority leader and he called on the Congress to preserve its self-respect and override the veto. The Senate overrode it 72 to 14 and the House 299 to 95. CPUSA defector Louis Budenz testified he could name 400 individuals involved in the Communist conspiracy; others testified there may have been over 1000. The Silvermaster group infiltrated 27 high level KGB operatives into government jobs in the Roosevelt administration that were still employed in the US government well after World War II ended. Roosevelt had his closest election in 1944, with a subdued contest that was decided by turnout of FDR allies in the cities and labor unions, and increasingly among soldiers. Strom Thurmond also supported FDR's decision to seek a fourth term, and referred to Roosevelt as having been the world's greatest leader. At the Yalta conference in February 1945, victory was in sight in Europe. A reparations commission was set up to help repay Russia from German assets. Everyone realized that the weak acquiescence in the conquest of Eastern Europe by the Red Army guaranteed Soviet dominance, but efforts were made to get promises of fair elections; the promises were made, but the elections were never held. Roosevelt, despite his failing health, seemed to think that he and Stalin would personally iron out any difficulties after the war ended. FDR persuaded Stalin to promise to enter the war against Japan 90 days after Germany surrendered; Stalin did so. Roosevelt used a "competitive administration" strategy to maximize presidential power at the cost of confusion, delay and inefficiency. He made sure in each policy area that several top officials had overlapping jurisdictions. They would feud and have to bring the problem to FDR, who wanted to make every final decision. For example, in the case of the PWA relief program, the competition over the size of expenditure, the selection of the administrator, and the appointment of staff at the state level, led to delays and to the ultimate weakness of PWA as a recovery instrument. Harold L. Ickes headed the PWA (as well as the Interior Department), and FDR set it up so that Ickes had to continuously fight other top administrators like Lewis Douglas (the budget director), Henry A. Wallace (Secretary of Agriculture) and Harry Hopkins (head of rival relief efforts). The rivalries were just as fierce for other top administrators, many of whom resigned in frustration and (like Hugh Johnson and Raymond Moley) even became enemies of Roosevelt. Roosevelt kept up his divisive strategy during the war, causing enormous confusion and contradictions in economic mobilization. It got so bad that FDR had to publicly humiliate Vice President Wallace and relieve him of all responsibilities. The Navy found a solution, as Admiral Ernest King deliberately kept FDR in the dark. Even when his fleet was threatened by the Japanese at Midway in May 1942, and King urgently needed the help of the British Navy, he decided not to ask because the request for help would have to go through Roosevelt and King refused to allow the White House to learn what dire peril the nation faced. Lucky for King—very lucky—he won a terrific victory at Midway. "We cannot read the history of our rise and development as a nation, without reckoning with the place the Bible has occupied in shaping the advances of the Republic." "Where we have been the truest and most consistent in obeying its precepts, we have attained the greatest measure of contentment and prosperity." "I hope that you have re-read the Constitution of the United States in these past few weeks. Like the Bible, it ought to be read again and again." "Those forces hate democracy and Christianity as two phases of the same civilization. They oppose democracy because it is Christian. They oppose Christianity because it preaches democracy. Their objective is to prevent democracy from becoming strong. "Those forces hate Democracy and Christianity as two phases of the same civilization." The Nazis are as ruthless as the Communists in the denial of God. "In his second inaugural address, FDR pledged to do his utmost by 'seeking Divine guidance.' He took that mission further on January 25, 1941, when he wrote a personal prologue to a special edition of the New Testament, which was distributed to millions of U.S. soldiers. 'As Commander-in-Chief,' Roosevelt wrote, 'I take pleasure in commending the reading of the Bible to all who serve in the armed forces of the United States.' He believed that all American soldiers should have the opportunity to read the words of Christ in preparing for battle. Once, when joining those soldiers aboard a warship with Winston Churchill, FDR asked the crew and prime minister to join him in singing the hymn 'Onward Christian Soldiers.' In his final inaugural address, FDR affirmed, "So we pray to Him for the vision to see our way clearly ... to achievement of His will.' "
When American soldiers were landing on the beaches of Normandy, Roosevelt led the nation in prayer during a radio broadcast. Statue of the president at The Franklin Delano Roosevelt Memorial in Washington D.C.
Roosevelt is an admired but still hotly debated president. Many credit Roosevelt with helping the United States survive the Great Depression and with providing solid leadership during World War II. Others, especially conservatives, assert that he uselessly expanded the welfare state, abused executive powers, and badly botched diplomacy before and during World War II. Roosevelt's image appears on the dime. It was essential that he do everything in his power to reestablish confidence in the economic system. What the nation needed was more jobs at machines, in ships, in mines and stores creating and distributing goods that were needed and providing wages and profits with which these goods could be purchased. If there are to be jobs for all they must be jobs producing something - goods and services. He began with a sweeping attack upon business and kept it up until the end of World War II. When Roosevelt came into power business was regarded as some gigantic criminal conspiracy against the welfare of the nation. Business cannot function at full measure unless consumption is held within total output, and savings are produced. Those savings then must regularly flow into new investment. New investment means the flow of economic resources into establishing new industries and the expansion of old ones. It means encouraging construction trades, manufacturing, producing and installing new equipment and tools. It means allowing the creation of new private businesses. Instead FDR carried on ceaseless attacks and denouncements of business, warned people against it, subjected businesses to dozens of absurd, semi revolutionary schemes, coupled with deficit financing which ate up all the savings, inflation, utopian panaceas, constant preaching that profit was evil, investors parasites, and businessmen scoundrels and enemies of the people. "The lessons of history, confirmed by the evidence immediately before me, show conclusively that continued dependence upon relief induces a spiritual and moral disintegration fundamentally destructive to the national fibre. To dole out relief in this way is to administer a narcotic, a subtle destroyer of the human spirit. It is inimical to the dictates of sound policy. It is in violation of the traditions of America. Work must be found for able-bodied but destitute workers. The Federal Government must and shall quit this business of relief." "Many hard lessons have taught us the human waste that results from lack of planning. Here and there a few wise cities and counties have looked ahead and planned. But our Nation has "just grown."" "The plans we may make for this emergency, if we plan wisely and rest our structure upon a base sufficiently broad, may show the way to a more permanent safeguarding of our social and economic life to the end that we may in a large number avoid the terrible cycle of prosperity crumbling into depression. In this sense I favor economic planning, not for this period alone but for our needs for a long time to come." Schlesinger, Arthur M. Jr., The Age of Roosevelt, 3 vols, (1957-1960), the classic narrative history. Strongly supports FDR. ↑ There were very few Southern Republicans in office. ↑ Tradition was restored by the 22nd Amendment in 1947. ↑ Race and the Politics of Polio: Warm Springs, Tuskegee, and the March of Dimes, Naomi Rogers, PhD. American Journal of Public Health, May 2007. ↑ After World War II Corcoran employed Soviet agent Duncan Lee in his Washington law firm, Corcoran and Youngman. FBI Silvermaster file biographical details on Duncan C. Lee, Elizabeth Bentley's allegations concerning him, his contacts with Donald Wheeler and Mary Price, Vol. 92, pgs. 20 - 21 pdf, January 26, 1947. On June 6, 1945, 6 persons, including U.S. government officials Andrew Roth and John Stewart Service, were arrested on conspiracy and espionage charges related to possession of roughly 1000 stolen classified Government documents in the offices of Amerasia magazine. Amerasia, edited by Philip J. Jaffe, had published classified materials verbatim from the United States wartime intelligence service, the Office of Strategic Services (OSS). Amerasia's chief financial benefactor was Frederick V. Field. Joseph Milton Bernstein, a GRU contact between Soviet agents in the OSS and the Board of Economic Warfare, was also an employee. Others connected with the Amerasia scandal were T.A. Bisson and Owen Lattimore. Corcoran worked with the Truman administration to cover up the scandal. ↑ League of Nations Monthly Bulletin of Statistics, June, 1936. Percentage change 1929 to March 1936, United States -21.8%, rank number 13. ↑ New Deal Policies and the Persistence of the Great Depression: A General Equilibrium Analysis, Harold L. Cole and Lee E. Ohanian, Journal of Political Economy, volume 112 (2004), pages 779–816. ↑ Standard Statistics Co., New Honey for Operating and Producing. ↑ Midland Bank, London, New Issues for British Companies, converted from £ to $ at $4.8665. ↑ Quoted in Robert E. Sherwood, Roosevelt and Hopkins: An Intimate History, (1948), p. 138 pdf. ↑ Has Stalin Revived the Comintern?, from Fourth International, September–October 1947, Vol.8 No.8, pp.231-233. Transcribed, edited & formatted by Ted Crawford & David Walters in 2008 for Encyclopedia of Trotskyism Online. Retrieved from marxist.org April 3, 2010. ↑ Counterintelligence Reader, National Counterintelligence Center, United States, Vol. 2, Ch. 4, n.d.
↑ Roosevelt and Hopkin, Sherwood, pg. 739. ↑ Roosevelt and Hopkin, Sherwood, pg. 740. ↑ FBI Headquarters File 100-63, Louis Francis Budenz, Internal Security—C, Serial 122. ↑ Executive Sessions of the Senate Permanent Subcommittee on Investigations of the Committee on Government Operations (McCarthy Hearings 1953-54). ↑ FBI Silvermaster file Vol. 15, pg. 4 pdf. ↑ Dean Acheson and Lewis Douglas also resigned in anger but kept quiet, allowing FDR to bring them back during the war. The vocal ones were entered on an enemy's list and permanently barred from serving the nation. ↑ Quoted in DeMar, The Untold Story, p. 60 and Gabrial Sivan, The Bible and Civilization (New York: Quadrangle/The New York Times Book Co., 1973), p. 178. ↑ Roosevelt and Hopkins, Sherwood, 1948, pgs. 193-194 (pgs. 211 - 212 pdf). ↑ Franklin D. Roosevelt Presidential Library and Museum, Franklin Roosevelt's D-Day Prayer, June 6, 1944. ↑ Roosevelt Myth, Book 3, Ch. 4, Toward the Precipice, Flynn, 1948. This page was last modified on 9 April 2019, at 09:00. This page has been accessed 232,843 times.